The Asus ZenBook S is a slim and stylish Ultrabook that’s high on performance and ergonomics but limited on port availability and battery life. It’s the laptop to get if you have no problems living the dongle life. It becomes clear the minute you open the lid of the ZenBook S that its design isn’t one you’d call regular. To begin with, the ZenBook S feels like a sharp meat cleaver in the hands because that’s how slim it is. At 1.29 centimetres, the ZenBook S is half a centimetre slimmer than the original Apple MacBook Air. Set the ZenBook S on a table and open the lid—you’ll find that the rear end of the keyboard rises in height with it, creating a forward tilt of 5.5 degrees for easier typing. According to Asus, that’s the ErgoLift hinge at work. 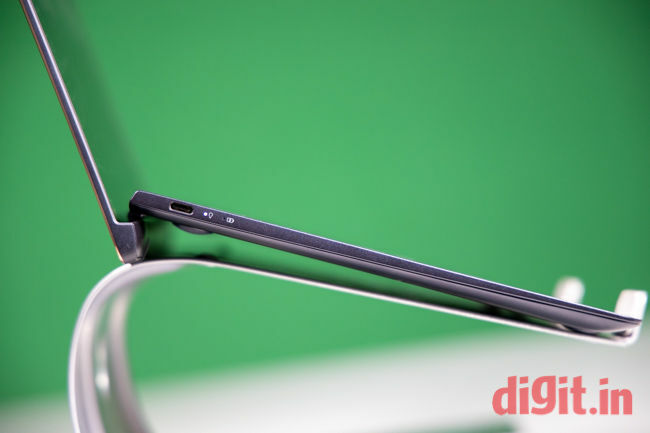 The Asus ZenBook S uses an all-metal unibody construction. The lid has the Asus Zen series’ signature concentric-circles pattern on it, which feels grippy to hold and carry around. 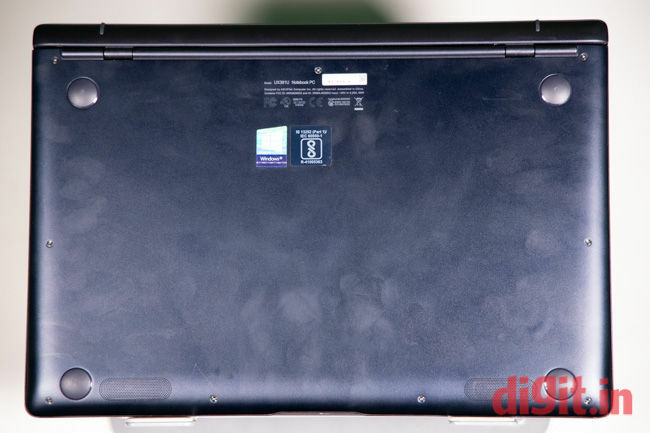 The laptop can be opened with a single finger, although some effort is required to separate the lid from the base at first. The area below the keyboard feels comfortable for resting your palms while typing. The rise created by the ErgoLift hinge definitely goes some way in increasing overall typing comfort. At 1.05 kilogrammes, the ZenBook S feels very lightweight in the hands. All in all, build and design on the ZenBook S is right up there on top. The Asus ZenBook S’ display is a 13.3-inch Full HD LED-backlit unit with an aspect ratio of 16:9. Asus has chosen to keep the surface glossy even though the screen beneath it is not a touchscreen panel. This causes light to reflect off the surface in some angles, which is an acceptable trade-off for better aesthetics. Speaking of angles, the display hinge folds back to a maximum of 145 degrees. It’s definitely enough for working in odd positions but there are times you’ll catch yourself wishing it could go completely flat. According to Asus, the ZenBook S’ display is capable of reproducing 100 percent of the colours in the sRGB colour scale. According to our test however, it covers 96 percent of the colours in the sRGB colour scale and 74 percent of the colours in the Adobe RGB colour scale. Colours appear rich and full while working and watching movies on the ZenBook S. The screen’s maximum brightness of 237 LUX is sufficient for working in most indoor and outdoor areas. Asus touts the laptop’s high screen-to-body ratio of 85 percent, which becomes apparent when you open the lid. 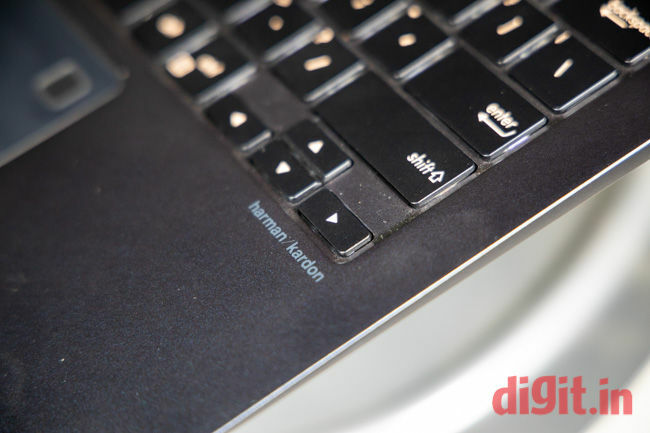 The bezels on the side of the laptop measure a positive 5.9mm. The 178-degree horizontal viewing angle is sufficient for most working positions. All things considered, the ZenBook S’ display is definitely top-grade. Audio from the ZenBook S’ two down-firing speakers is crisp and high on volume. Bass output, considering the laptop is only an Ultrabook, is substantially rich. There’s enough thump and depth while playing bass-heavy tracks like Ini Kamoze’s Here Comes the Hotstepper and Leonard Cohen’s A Thousand Kisses Deep. Vocals and instruments like trumpets and violins sound full and controlled with no or few noticeable signs of distortion. Sound from the Harman Kardon-certified speakers do threaten to tear when the volume is turned all the way up to max but it’s still rather rare. Ports on the Asus ZenBook S can be counted on the fingers of a single hand: three USB Type-C ports (of which two are Thunderbolt 3, and one is USB 3.1) and a 3.5mm audio jack for headsets. The laptop is simply too slim to accommodate even a single USB-A port, leave alone an HDMI port and card reader slots. 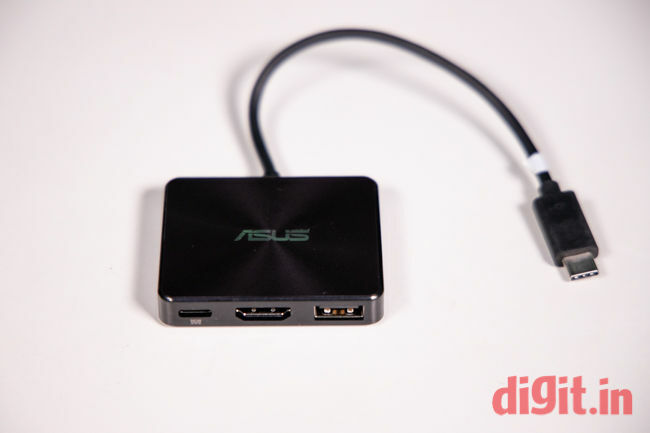 To make amends for the lack of ports, Asus has included a “Mini Dock” with the ZenBook S. When connected, the tiny matchbox-sized rectangle gives you access to one USB-A port, an HDMI port, and a USB-C port. If you’re the type of user who regularly uses USB-A ports, you’ll want to look away from the ZenBook S. But if you think you can make do with just USB-Cs or live the ‘dongle life’, then you should have no qualms with the Asus ZenBook S’ port setup. The first thing you’ll notice about the Asus ZenBook S’ keyboard is that the keycaps are really large, which is great because it gives you enough real estate to strike the keys and little chance to miss hitting a key. The surprising thing about the ZenBook S’ keyboard is that the keys offer sufficient travel (1.2mm of it to be precise) despite the slimness of the base. Keystrokes happen with a gratifying clickety-clack, making typing, for the most part, an easy affair on the ZenBook S. The three-stage backlighting on the keyboard lights the keys up in a warm off-white colour against the blue-black background, making it easy on the eyes when typing at night. The colour matches the warmth of the screen when Windows’ Night Light feature is turned on. I do have a couple of grouses with the keyboard design though. First, the power button is placed right next to the delete key at the end of the top-most row, which does not bode well for those who correct their typing a lot. Second, there are no dedicated keys for Home, End, Page Up, and Page Down functions, which knocks some points off for this otherwise efficient keyboard. Finally, I wish the arrow keys were larger. All things considered, typing on the Asus ZenBook S is a pleasurable experience. The touchpad on the ZenBook S is undoubtedly a modern precision unit, which means multi-finger taps and swipes can be customised using Windows Settings. Movements are smooth and brisk on the matte-finish touchpad. Clicks are soft, precise, and happen with ample feedback. If anything, the size of the touchpad itself could have been larger. The ZenBook S’ touchpad integrates a square fingerprint sensor on the top right corner that works swiftly and precisely while logging in. The Asus ZenBook S sells in a single variant in India that packs an eighth-generation Intel Core i7-8550U CPU, 16GB of RAM, and a 512GB Toshiba NVMe solid-state drive. Graphics is handled by an Intel UHD Graphics 620 integrated GPU. With all of this in its spec sheet, the Asus ZenBook S scored rather well on our benchmark tests. 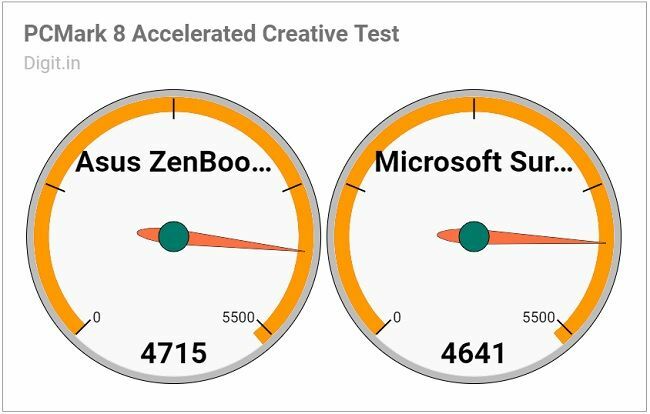 In PCMark 8’s Accelerated Creative test, the ZenBook S outscored the Microsoft Surface Book by 74 points. With its integrated GPU, it scraped through video benchmark tests with very average scores. The ZenBook S showed off its speedy storage device by scoring 753 megabytes per second on CrystalDiskMark’s sequential read test and 523 megabytes per second on CrystalDiskMark’s sequential write test. In the real world, performance is very much up to the mark on the ZenBook S. With an ample 16GB of RAM, I was able to open and switch between over a dozen applications across multiple virtual desktops on the review unit. Writing while playing music on iTunes, installing a benchmark application, browsing on numerous instances of Chrome, and downloading updates for a game on Steam happened simultaneously without any trouble on the laptop. There were a couple of instances when the laptop froze and showed a Blue Screen of Death before restarting but I’ll chalk that up to software glitches. 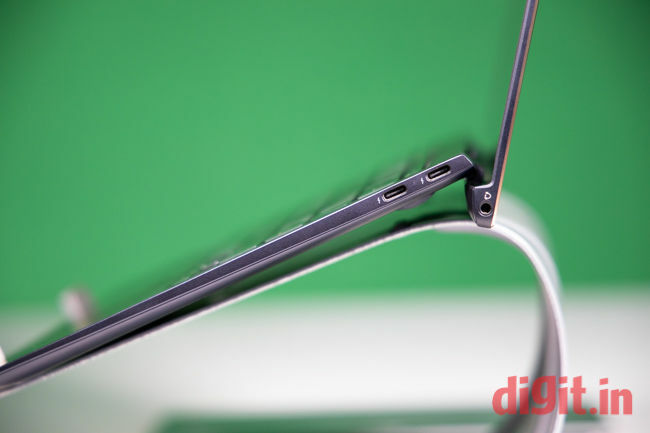 It’s not just good that the ErgoLift hinge on the ZenBook S raises the base of the laptop from the user’s lap but necessary because the Intel inside runs hot. During app installations and video playback, the temperature of the CPU package climbs to a threatening 80 degrees Celsius. This warms up the keyboard more than one would expect, making typing and resting the fingers on the keycaps somewhat uncomfortable. For the most part though, heat is very much bearable on this thin and light. Performance, on the whole, is top-class on the ZenBook S. It’s great for somebody who wants style, compactness, and outright crunching power from their laptop. It’s for somebody who spends hours on applications like Chrome, Word, PowerPoint, and Outlook but not on video-intensive applications like Adobe Photoshop. For a laptop whose body has been designed for a life on the go, the battery doesn’t last very long. 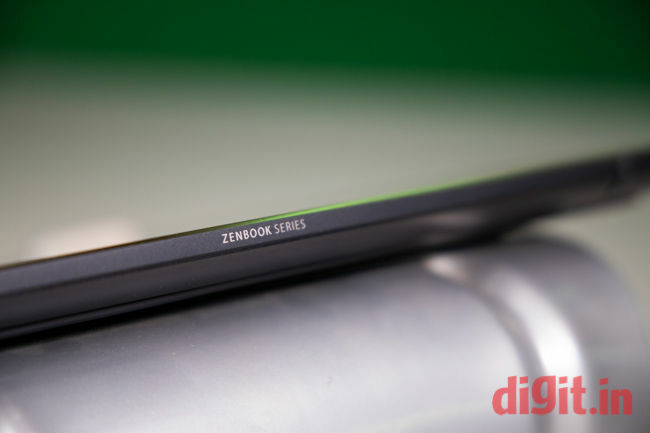 This is probably because there isn’t too much of it inside the ZenBook’s slim and compact base. On our battery benchmark test, the ZenBook S lasted 3 hours, 48 minutes on a single charge, which, frankly, is on the lower side. In comparison, the Microsoft Surface Book lasted 4 hours, 12 minutes during the test. During everyday use, things seem worse, because the battery on the review unit plummeted from 54 percent to 19 percent after just an hour of browsing and music playback through earphones. With the music turned off and just a couple of boring documents open, the battery fell from full to 75 percent in 1 hour, 45 minutes. Charging from near zero to full took about two hours. On an average, expect the battery on the ZenBook S to last about four hours on a single charge and no more. In more ways than one, the Asus ZenBook S reminds me of a motorcycle Honda launched some ten years ago as a more fashionable alternative to one of its top-selling commuter motorcycles in India. It was called the CBF Stunner and was aimed at those who preferred style over substance. The Asus ZenBook S is something like that—as a lifestyle product that’s also high on performance, the ZenBook S nails it but as a thin and light that offers value and battery life, it falls short. 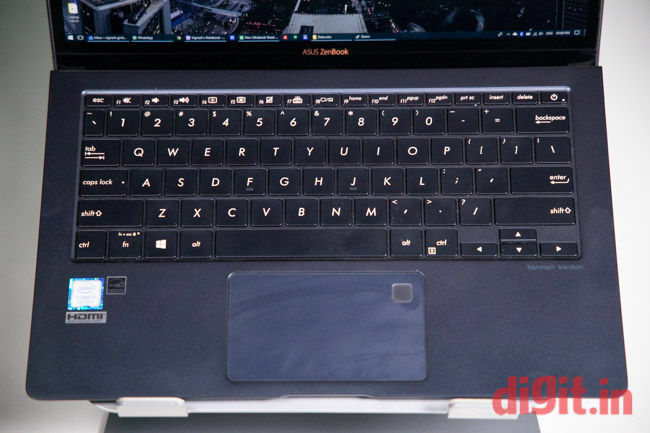 The Asus ZenBook S is for you if you want a slim and stylish Ultrabook that’s got enough power for business and play, provided you don’t mind the below-average battery life and its forever-conjoined dongle called the Mini Dock. All this comes at a rather steep price of Rs 1,29,990. What\'s the world\'s fastest supercomputer used for?